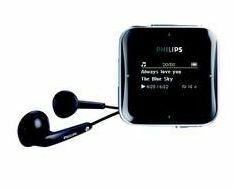 Philips has launched a new range of tiddy little MP3 players this week, aiming for a slice of the growing market that Apple has been targeting with the iPod shuffle. As ever, the Philips brand-naming leaves a lot to be desired – with the four units being uninspiringly dubbed the SA2845, the SA2825, the SA2840 and the SA2820. Come on Philips! Hire a brand-naming professional! Naming issues aside though, the products are pretty nifty, with 2GB or 4GB worth of storage, FM-radio options with certain models and – the real iPod Shuffle beater - an embedded small screen, so that you can actually control what you listen to. Add to this the easy drag-and-drop interface and it looks like Philips is on to something here, particularly for those MP3 consumers who want a small, pocket-friendly player for when they're out and about.